I recently spent an entire weekend working on a database server migration project. It did not go well and we ended up rolling back to the old server and rescheduling the migration for another day. The attempt took from Friday evening to Sunday morning and, with all the troubleshooting we had to do, it was mentally exhausting. I went home Sunday night, slept for 6 hours, and headed back in Monday morning to make sure everything was still working. As I was driving in, I realized just how drained I was. It wasn’t just a lack of sleep. Mentally, I was done in. I felt like I couldn’t look at SQL Server again. I needed to recharge. So I turned on my iPod, cranked up the volume, and queued up some pop music. If you will allow me another example of my über-geekiness, as the songs played, I had a mental image of a health bar floating over my head, near empty but quickly refilling as the music worked its magic. Pop music does that for me. For some, it’s rock music or chocolate or movies or biking or running or something else. For me, it’s those sticky sweet songs with the catchy hooks that infect your brain and leave you humming the song for the next three days. And now, dear reader, it’s time I make a little confession. Don’t tell anyone else. This is just between you and me. 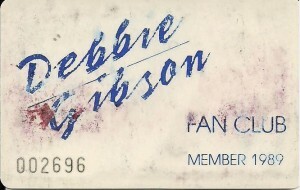 I’m a Deborah née Debbie Gibson fan. Have been since her first album in 1988. It’s loaded with catchy little pop nuggets that sucked me in instantly. But it’s not only her songs I like. I’m a pushover for any catchy pop gem. What is it about pop music that I find so attractive and so rejuvenating? Sure, the music is catchy. But the lyrics are what do it for me. The best pop songs are about love – first love or lost love or unrequited love. They capture those glorious moments that everyone in life has had at some point: the exhilaration of a new relationship, the thrill of your first kiss, the way the world seems so much brighter when you’re together. They also capture the pain: the devastation you feel after a breakup, the certain conviction that you’ll never love again, the unending, bottomless, crushing, heart-rending pain. Those visceral feelings are typically forever bound up in a time from your youth – a time when you were just starting to date and trying to figure out what love was and what it meant. The golden summers of your adolescence when you hung out with your friends in the sun, woke up late and stayed out later, had crushes and got crushed. All those feelings are there, woven into those songs and standing as a reminder that you are not alone and you are not the only one who has gone through the rollercoaster of love. You are part of a communion of humans, all searching for love, at times finding it, at times losing it. And what those songs tell you, ultimately, is to never give up. Finding love is always worth the pain of the search. Always. THAT is what rejuvenates me. What about you? Are you going to post about what when wrong, how you debugged it, and what you plan to do differently in your next migration attempt? Dude, I LOVE Debbie Gibson. I’m sad that I never got one of those back in the day. I was about 16 when she came out, same age as she is.